Standing in the schoolyard, I’d wait. Attending a small Christian school as a child had its perks, one of them being that it ended about the time my Uncle Jim would get off the day shift at the paper mill. I’d wait outside, hoping he’d show up while my friends were there. I was so proud of my Uncle Jim, whose exuberant personality and booming voice loomed larger than life over my shy, quiet self. A picture of me and Jimmy. When his Ford truck would pull in the dusty drive, I’d climb up in the passenger seat beside him. We’d head out on the open road, windows down, wind in my hair. When a song came on that he liked, he’d turn up the radio, slip his hat to the side, and sing loudly with a country twang. And me? I'd be grinning from ear to ear. We’d make a quick stop in Hill City for a can of pop and candy bar that I didn’t have to share (a HUGE treat for this little girl, who usually had to split treats three ways with her sisters) before making our way to my uncle and aunt's farm. He had a love for life and for people, especially kids, like few others my little eyes had seen. While most adults would engage us children for awhile and then tire of our childishness, Jimmy was different. He was always glad to see you, seemingly never tired of the silliness of being a kid. He loved people. And he loved stories. In fact, few people could tell stories like my Uncle Jim. In the evenings after the work had been done, we’d sit around the table and he’d tell tales. His voice usually started off quiet, getting more animated and boisterous as the story went on. Sitting on the edge of your seat, you never knew how his story would end. Most nights he’d have us laughing so hard, we’d cry. There was no need for TV with Jimmy around, his stories were entertainment enough, and I loved every minute of it. Talking about the seemingly insignificant, they were stories about everyday life, songs about ketchup and mustard. Even as an adult, I loved hearing Jim’s stories. Many I had heard time and again over the years. Stories from when he was younger; many about his wife, my aunt Delpha, whom he lovingly referred to as “Girlie.” It didn’t matter how often I heard a story, he could always make you laugh. Tell me again, Jim, about the time Girlie mistakenly took men bending over in a ditch for pigs. Or the time Jeremy climbed near to the top of the pine tree out front. How about when the horses spooked and you had to sit all the way back on the hay wagon to get them to stop running. And as it has been a little over two years since my uncle passed away, I find it is his stories I miss the most. Sitting with my aunt, she now picks up where he left off. Telling me about their life on the farm, how they moved there so many years ago to just a little house with no electricity or running water. Raising children and fostering and adopting others. The joys and struggles they shared together over the past fifty years building a life together on the farm. Because it is part of my story. And it is flawed. And beautiful. Tragic. And yet, lovely. 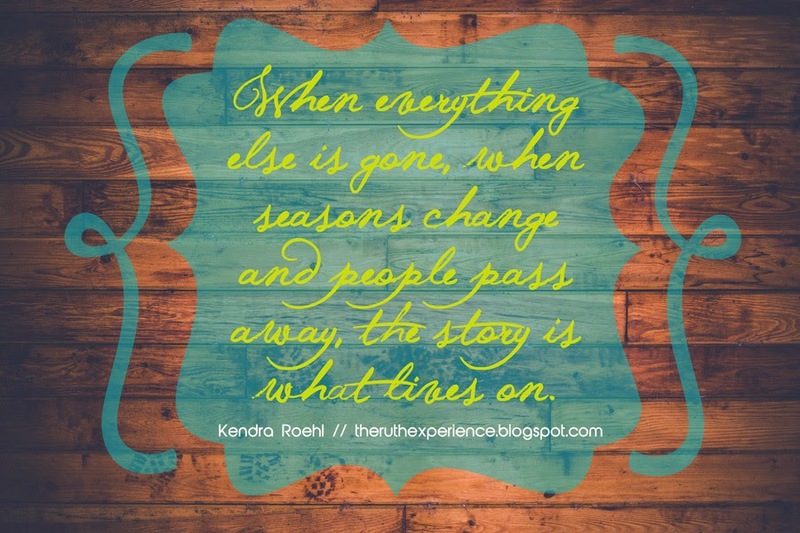 When everything else is gone, when seasons change and people pass away, the story is what lives on. Have you entered our giveaway? Submit your story for a chance to win a stunning Storyteller necklace from Jodi at Broken and Beautiful! We're also once again linking up with the lovely Holley Gerth today. What a wonderful tribute to your uncle. It is amazing to listen to my grandmother and aunt to hear about life back when. What a great thing to pass on to your own children as well! Thanks for commenting Heather! My kids are one of the biggest reasons I'm starting to write down more stories, I don't want them to forget either! Hi, kendra -linking next to you at Holley's coffee this morning. I lost both my parents (and our dog!) this year - a year of loss yet not completely unexpected as mom was 95 and dad, 97. They were great storytellers and we all miss them. Thankful for them, for you, our stories and God's best story. Amen. Sue, Thanks for stopping by! I am so sorry to hear about the loss of your parents, it's always difficult, no matter the age. Blessings to you! Kendra, what a beautiful story about your uncle. I believe he passed on his talent as a storyteller to you. You were a lucky girl to have him in your life! Jeri, Thanks so much for your kind words! And you're right, I was very lucky! Blessings to you! Kendra, this is a wonderful story. I too like listening to stories from other people so thank you for sharing a memory of yours. This reminds me of a special uncle. He cooked gourmet meals, and smoked a pipe, and was a business bigwig in his very small town - to my young eyes he was as glamorous as the Mad Men. 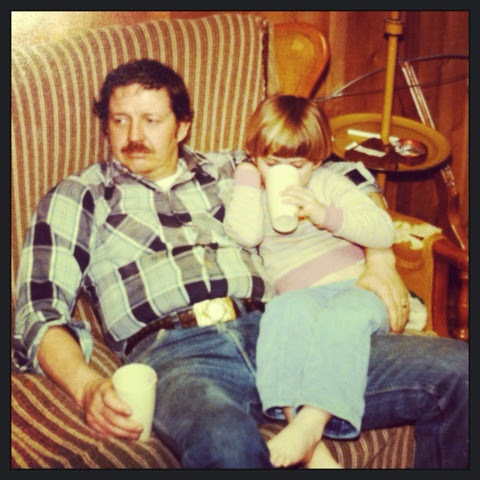 I loved to sit on his lap and listen to him tell stories with my dad - they would laugh and laugh. Thanks for sharing your story Amy! This is the sweetest post that made me smile : ) Thanks for sharing such a beautiful story with us Kendra! What an engaging post! Thanks for sharing your memories with us. What a sweet story of beautiful memories of your uncle! I have an Uncle Jimmy too who I love dearly. Stories never die. They are perfect gifts from those we have lost. Thanks for sharing this touching part of your life, Kendra!